The team behind Yobongo, the location-based mobile chat application that was acquired by Mixbook in March, is finally ready to reveal what they’ve been up to in the months since. We already knew that Mixbook wanted to expand into the mobile photobook space, and had essentially hired the Yobongo team for their talents, not the Yobongo application itself. And those talents have been put to good use it seems. The forthcoming iOS application called “Mosaic” aims to address all the reasons why photobooks aren’t more popular, which includes the time it takes to make them, the cost, and the way they’re currently marketed. The Yobongo team has been operating in stealth mode since joining Mixbook – the rest of the company was only filled in on Wednesday about the project. To be clear, the mobile photobook app isn’t meant to be a new direction for the company as a whole, but a way to reach a new demographic of potential users – those who have never before created a photobook. “We set out to challenge the core assumptions about what a photobook was and who a photobook should be for,” says Yobongo co-founder Caleb Elston. “We found that there’s lots of people who have heard of photobooks, but not a lot of people have actually made their own.” One of the reasons which has hindered photobook adoption in the past, says Elston, is the way they’ve been traditionally marketed – that is, that they’re meant for “special occasions” and major life events like births, weddings, anniversaries, or family vacations. First of all, those types of events don’t happen all the time, which limits the number of opportunities to create one. But it also doesn’t accurately reflect how people take and enjoy photos today. People are no longer just snapping photos at big events – thanks to the ubiquity of cameraphones, they’re taking photos everyday, everywhere. On the social photo-sharing website Flickr, for example, the top two “cameras” represented are the iPhone 4S and the iPhone 4. 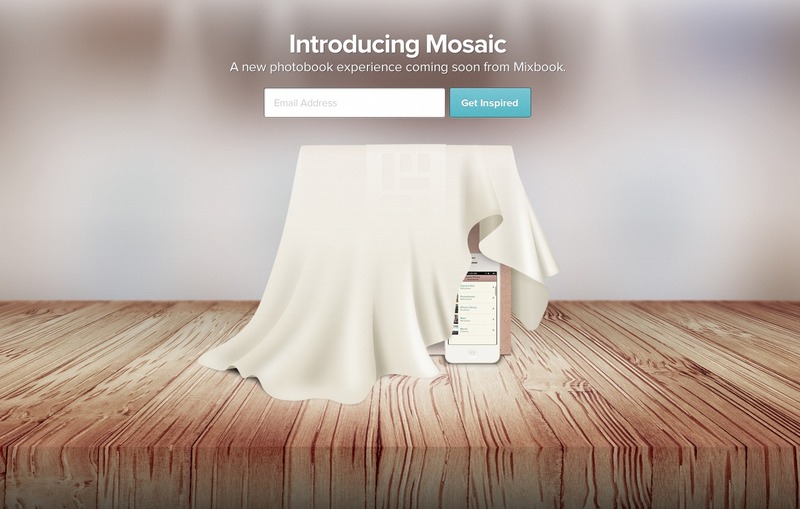 With Mosaic, Mixbook hopes to address all these pain points associated with traditional photobooks. They’ve taken care to design an app which lets you build a photo book in a minute or so, instead of hours. To accomplish this, one feature they’ve focused on is the photo picker, Elston says. In some apps, selecting photos is tedious and slow, and you often have to upload items one-by-one. Also, when you take multiple shots of the same thing, it’s hard to tell in the small thumbnail view which is the best. Plus, it tends to be difficult to upload a lot of photos all at once. Elston says Mosaic has addressed these problems head on, but unfortunately, we can’t confirm that yet because the app is not publicly available now. To keep costs down, Mosaic has also limited the output to just one product SKU. There’s no variety of books to choose from, and there aren’t tons of page templates. Well, that sounds like the photo books might be kind of boring, then, I told Elston. Homogenous even. But he hinted that Mosaic is doing something interesting with the covers to keep each one looking unique. For now, photos will be sourced from the iOS Camera Roll and Photostream, but it may offer social network integration later on. Exact pricing is not set, but it will be per-book, with possible subscription plans offered in the future. Although the app won’t launch publicly until sometime pre-holiday season 2012, TechCrunch readers who sign up from this link will get early access.